How Are Your Feet Holding Up? Instead of saying howdy this month, I'll open by asking "How are your feet holding up?" I think that should be the traditional greeting between hikers, don't you? It gets right to the bottom of things! If your feet aren't happy, they will plot mutiny and hijack your hike using an incredible array of weapons: blisters, soft tissue strains, hot spots, and sore toes just to name a few of their favorite tactics. So to give your tootsies the best possible chance at happiness within your hiking boots, I've got some foot care tips for you. I've also got a few deals and an outright give away which you should take advantage of right away. I also want to share with you a few reader comments about hiking gloves (see last newsletter for context) and a 3 minute trail video that manages to capture the essence of hiking. And if you've been waiting to sign up for a hiking course, now's the time! They bear the burden (literally) yet get very little respect in most hiking publications. I decided to shine the spotlight on these handy little digits by writing an article for Seattle Backpackers Magazine (no longer available), chock-full of foot care tips you can use before, during and after a hike. My favorite tip: To short circuit inflammation, plunge hot, swollen, achy feet into an icy stream, or use your bandanna or hat to create an impromptu cold pack from a snow field. Ah! It hurts so good! Lots of folks enlightened me on why wearing sun gloves is a good idea. Maybe I should be turning my attention away from feet, to my hands! One of the most visited pages on my website is about hiking skirts. I recently purchased one, but haven't had a chance to wear it because my summer hiking was mostly off trail explorations. My legs would look like a war zone if I'd been wearing a skirt! But I'm fully committed to the idea of a hiking skirt: comfort, ease of movement, fast pit stops, and femininity on the trail. And we might as well show off those hard earned hiking muscles, right? Here's a company whose handmade skirts are worth a close look: Purple Rain Adventure Skirts. 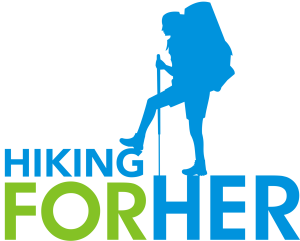 And here's the deal: Until September 26, 2015 you will receive free shipping by using this code: HikingForHer. Be sure to read Mandy's "back story" about these skirts! By the way, I get nothing but satisfaction if you order a skirt. I respect this company's mission to bring trail comfort to hiking women, and thought you might like to check out these skirts. Ready for a second deal? If you order from this link during the sale, I will receive a miniscule affiliate fee to help offset the cost of this newsletter. It costs you nothing extra, brings quality hiking apparel and gear to your doorstep, and helps me out - a win/win. I like CampSaver because they carry brands I use in every season, at reasonable prices. They have a decent return policy, too. End of season is always a good time to stock up and replace, right? I'll be ordering a new pair of pants to replace the pair I ripped the seat out of doing a "vegetable belay" a few weeks ago. Any idea how slippery duct tape is? Yeah, those pants gotta go! Have You Seen This PCT Video? I'm not a long trail hiker, and have never wanted to be. But when this video landed in my inbox, I knew I wanted to share it with you. Just Google PCT in three minutes! Condensing months of hiking into 3 minutes was a brilliant way to give all of us a glimpse of the Pacific Crest Trail's beauty and toughness. Be sure to note the low snow amounts in the Sierras & northern Washington State, and the reality that this summer's raging forest fires have altered the PCT experience you see on this video. I'd love to hear your comments! What do you think of the soundtrack? The course begins on September 21, 2015, which is the turn of the season and just the right time to try something new. And there's a substantial price break if you enroll by August 31, 2105. Yup! Only a few days remaining to receive the discount. So if you've been toying with the idea of joining a virtual community of women whose intention is to do a solo hike from a position of strength, what are you waiting for? Built into the course are weekly group Q&A calls, a forum to share information and exchange ideas, and lots of additional resources and materials for you to explore. I am deliberately keeping the class size very small in order to devote time and attention to each woman's unique concerns and questions. Enrollment will be shut down once I reach what I feel is the right mix and number of folks. So now you have 2 reasons for signing up today! Avoid the price increase which kicks in on September 1st, and join a small group of women to explore solo hiking virtually before heading off into solo reality! Not quite ready to go solo, but wondering if you should consider it seriously? I've got you covered in my "Is Solo Hiking For Me?" course, with on demand enrollment so you can start (and finish) it whenever you'd like. Self paced, just like soloing! And for you, wonderful reader of this humble little newsletter, I have a sweet deal. brand new FaceBook page and leave me a comment and/or "like" my page. That enters you into a drawing for a free "Is Solo Hiking For Me?" course! I will collect up all of the names on September 4, 2015 and select at least one (maybe more, depending on how much green tea I've had that morning) lucky winner. I'll notify you on 9/4 if it's you! You can get started instantly. And FYI - if you don't want to explore the course yourself, you could gift it to a trail buddy. Just send me the email address! And thanks for helping me enter the modern world of FaceBook (my twenty seven year old daughter sent me a "congratulations" card with an aroma of sarcasm). I'll be using this newly minted FB page to share daily updates and fun hiking stuff I find, which won't be in this newsletter. Get the Is Solo Hiking For Me course details here. Whew! These newsletters are getting longer and longer. I love gathering things to show you and share with you, and deeply appreciate your interest. Female hikers rock, that's for sure! And now we have 3 ways to stay in touch: this newsletter, email, and FaceBook! Watch for more course offerings coming soon, along with a weekly podcast. Send me your hot topics, and I'll do my absolute best to line up trail experts to help me answer all of your questions. May September bring you new beginnings, new gear, new horizons and new skin on your feet right where you need it!